You are at:Home»Reviews»U-nest iPhone app review. College fund saving for your children just became better thanks to U-nest iPhone app. 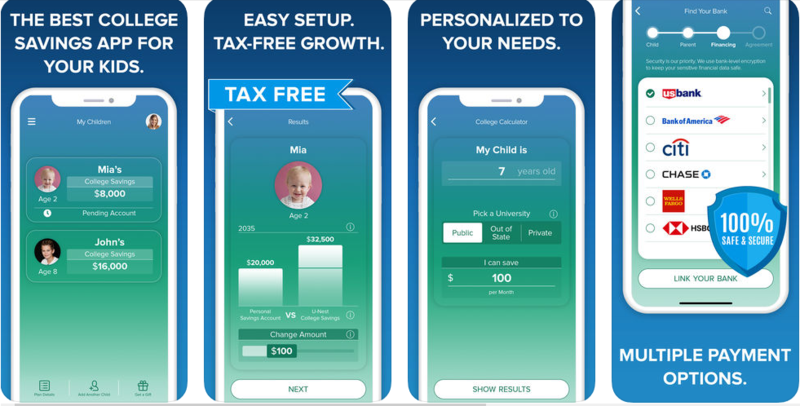 This incredible mobile application enables you to save your child’s college fund without straining. All you have to do is put aside as little as $25 and start enjoying the benefits of U-nest as a saving option. The app comes with so many incredible features that make it worth it. The first process once you open the app is to set up a plan by filling some essential details. These include the name of your child, his or her age, the university type you would like her to go whether public in state, public out-of-state or private. You will then be required to select the amount you will be able to pay monthly. Once that is done, you can link it to your bank account. This enables the U-nest app to deduct the amount from your account automatically every month and credit it to your child’s savings account. Some of the features that you stand to enjoy include. You don’t have to worry about your savings being subjected to tax as they grow, the package is tax-free with an incredible rate of return which is much better than that of banks savings accounts. All these are enjoyed first hand when you use U-nest iPhone savings app. U-nest understands the value of every single dollar when it comes to helping your son or daughter’s future education plans. They, therefore, don’t limit you to huge monthly savings that can be inconvenient. You can start your saving with as little as $25. This will make a huge mark in ensuring that your child has a sure future in terms of education. Research shows that conventional financial advisor who were used to help come up with different child savings plans used to be much pricier. This is not the case with U-nest iPhone app. You won’t have to shell huge monthly rate for your child’s education savings plan. U-nest only requires $3 per month, and you are all set. The security established on the U-nest mobile application is remarkable. It uses the sturdiest browser encryptions that assures the best security for its users. This means that every information you provide will be safe and inaccessible by unauthorized personnel. Only you will be able to access to access your account at your convenience. The simplicity of U-nest is incredible. It has a user-friendly designed in such a way that you only need basic knowledge to set up a child’s education savings account. You won’t have to undergo lengthy processes that can are overwhelming and annoying. The only requirements you have to do is fill in the basic details, and you will be good to go. • Only available for iPhone users. U-nest iPhone app is the answer to your children’s education savings plan. It comes with some interesting features to ensure that you have a great time saving for your child’s education. You get to enjoy astounding security features, and the minimum savings amount is incredibly low. It is just the perfect tool for keeping you in line with your child’s education savings. Next Article NomadPhone – Must Have Travel Facility !